The SPX line is a change up for Sea Ray, and with it, comes new opportunity for the company and consumers. The SPX retains the styling and quality of the sport and SLX models just at a new, entry-level price for the company – a win-win for all. With outboard and sterndrive models, three trim packages -Allsport, Comfort and Elevation – select options and a host of hull and trim accent colours, Sea Ray is offering more choices for consumers all-around. The basic goal of all the models is to provide a great watersports platform in a family-friendly runabout, thus the spacious bowrider layout. Starting at the stern, the 21 SPX retains a large swim platform with a four-rung telescopic boarding ladder, even with outboard power. 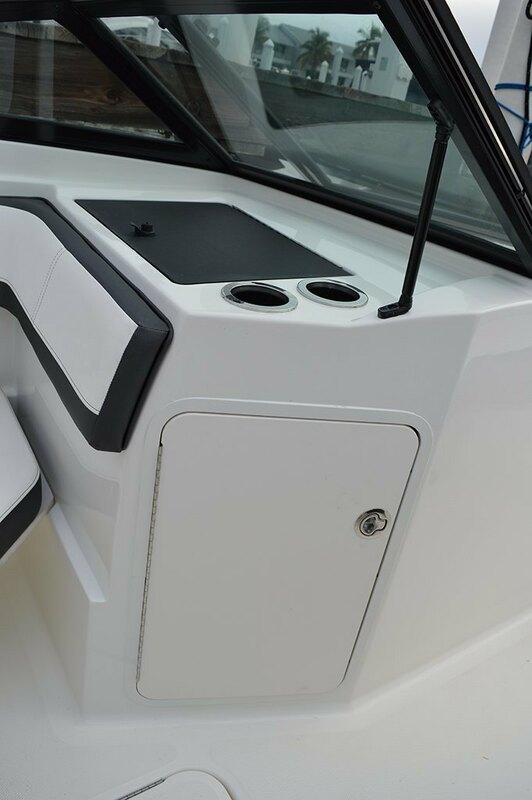 The SPX models also boast a comfortable sun pad that converts easily into transom seating. Choosing outboard power gives the SPX an enormous storage locker with a second locker to starboard. A hatch in the port side walkthrough provides access to the battery and more storage. There is even storage under the steps to the cockpit. Sea Ray has maximized the size of the cockpit by narrowing the gunwales and has designed seating to take advantage of the space. 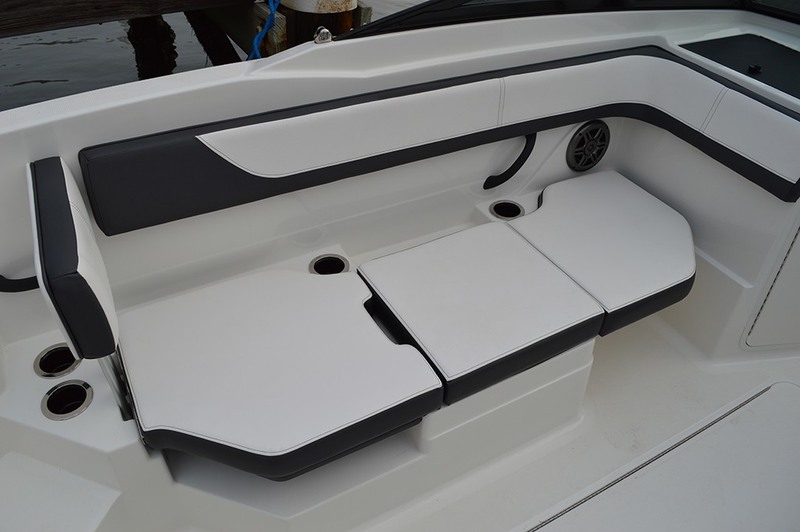 There is an “L” shaped seat aft with drained storage under the transom section and a cooler tucked in along the side. The port side provides some simple, flexible configurations for seating with options to face forward and to face the rear for spotting and lounging. The helm has a fully adjustable bucket seat that, when combined with the moulded footrest and tilt wheel, ensures a comfortable position can be found regardless of your size. It’s minimalist and clean, with multi-function gauges and illuminated toggle switches. The passenger console is incorporated in the cockpit liner. 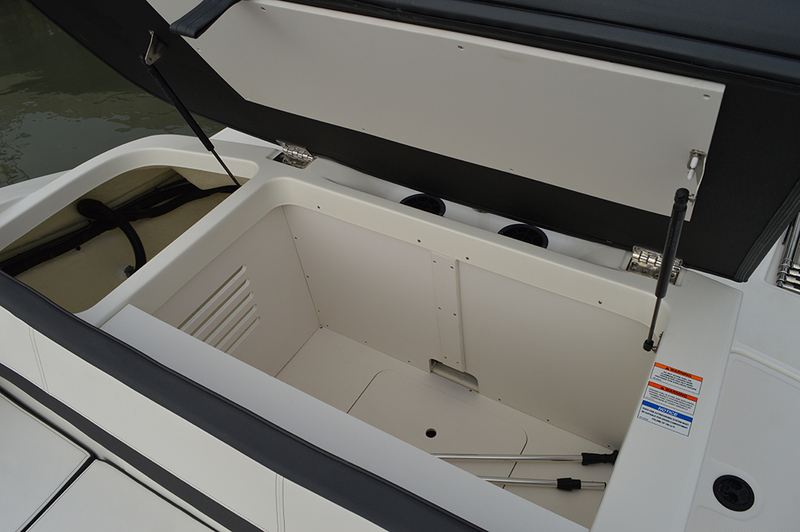 There is a locking top compartment where the stereo system is concealed and a large storage locker in the base. And of course, there is a large board locker in the cockpit sole. The bow area is large enough to accommodate three, two facing forward and one facing aft on the bow jump seat. Overall, the design, materials and layout of the SPX make for a fresh, new look for Sea Ray. The choices reflect their focus on watersports and fun. Even skipping the optional snap-in cockpit carpeting makes perfect sense. The SPX’s interior will see a lot of water splashed around, and it has been designed to stand up to all of the fun. 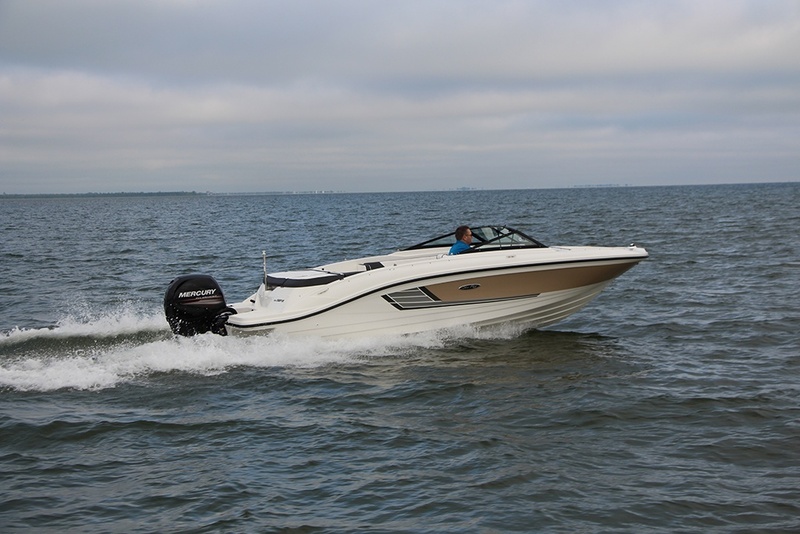 Standard power for the Sea Ray 21 SPX OB is Mercury’s 150 FourStroke. This relatively new three-litre, inline four-cylinder engine weighs in at 455 pounds- or 206 kilograms – significantly less than a sterndrive. This reduced weight helps turn in some respectable performance numbers. Acceleration is good, hitting 20 miles per hour in just six seconds and 30 mph in just short of 11 seconds. With the choppy conditions on test day, I could only get up to 45.8 mph as the top speed on the GPS. With less pounding from the water, a mile or two more may be available. Cruising at 3,500 rpm was a comfortable 27 mph. Given the wind and chop on test day, the ride was more than reasonable and surprisingly dry. Power steering made handling feel light and effortless when carving in and out of opposite lock turns. The 21 SPX felt quite sporty and lighter than her 34-hundred lbs dry weight. If you like the choice of the outboard power and plan on boating with a gang, you might wish to opt for Mercury’s 200 Verado to dial in some real fun. This profile is featured in the Summer issue of Boats&Places.